Buzz Bissinger is the author of two classic works of sports journalism, Friday Night Lights and Three Nights in August, and of A Prayer for the City, about Philadelphia politics. In 1987 he won a Pulitzer Prize for investigative reporting while at The Philadelphia Inquirer. He is a contributing editor to Vanity Fair and lives in Philadelphia. Patricia Bosworth, born in San Francisco, is a graduate of Sarah Lawrence College and a winner of the Front Page Award. She has written acclaimed biographies of Montgomery Clift, Diane Arbus, and Marlon Brando, and a memoir, Anything Your Little Heart Desires. A contributing editor at Vanity Fair, she has taught nonfiction at Columbia University and Barnard College. She runs the Playwright/Directors Unit at the Actors Studio. She lives in New York. She worked on many projects with Norman Mailer since the 1960s, including at the Actors Studio, where both served on the board, and at the PEN American Center, where she served as Vice President when Mailer was President. Da Chen is the author of Colors of the Mountain, a New York Times bestseller; Sounds of the River: A Young Man’s University Days in Beijing; Brother; and two books for children, Wandering Warrior and China’s Son: Growing Up in the Cultural Revolution. He grew up in China during the Cultural Revolution and now lives in New York. Carolyn Forché was born in Detroit in 1950. She is the author of four books of poetry: Gathering The Tribes, which received the Yale Younger Poets Award, The Country Between Us, chosen as the Lamont Selection of the Academy of American Poets, The Angel of History, which won the Los Angeles Times Book Award, and Blue Hour, a finalist for the National Book Critics Circle Award. She has translated Flowers from the Volcano and Sorrow by Claribel Alegria, The Selected Poems of Robert Desnos (with William Kulik), and Mahmoud Darwish’s Unfortunately, It Was Paradise (with Munir Akash). She compiled and edited Against Forgetting: Twentieth Century Poetry of Witness (W.W. Norton & Co., 1993). She has received three fellowships from the National Endowment for the Arts, a John Simon Guggenheim Fellowship, a Lannan Foundation Fellowship and other literary and teaching awards, including the Robert Creeley Award in 2005. She has been a human rights activist for thirty years, and in 1998, was presented the Edita and Ira Morris Hiroshima Foundation Award for Peace and Culture in Stockholm for her work on behalf of human rights and the preservation of memory and culture. In 2004 she became a trustee of the Griffin Trust for Excellence in Poetry, Canada’s premier poetry award. She serves as Executive Vice President of Cities of Refuge, North America. She is the Lannan Visiting Professor of Poetry and Professor of English at Georgetown University. Mary Gaitskill is the author of Veronica, nominated for a 2005 National Book award in the Fiction category. She is also the author of Because They Wanted To, which was nominated for the PEN/Faulkner Award in 1998. Her stories and essays have appeared in The New Yorker, Harper’s Magazine, Esquire, The Best American Short Stories (1993), and The O. Henry Prize Stories (1998). Her story “Secretary” was the basis for the film of the same name. The recipient of a Guggenheim Fellowship, she teaches creative writing at Syracuse University. She lives in New York. *PUBLIC EVENT IN CONJUNCTION WITH THE PROVINCETOWN PUBLIC LIBRARY* J. Michael Lennon is Emeritus Professor of English at Wilkes University. As Norman Mailer’s authorized biographer, he is currently editing Mailer’s selected letters and writing his authorized biography. 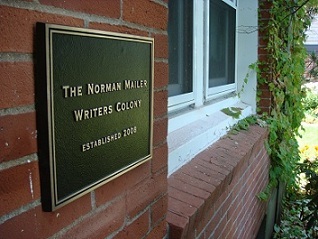 While at Wilkes he held various offices, including Vice President of the university and chairman of the Humanities Division, as well as co-director of the Wilkes University low-residency MA/MFA in Creative Writing, which he founded in 2004 along with current Program Director Bonnie Culver. He is also the current President and one of the founders of The Norman Mailer Society, a literary society dedicated to promoting interest and scholarship on the works of Norman Mailer. He published Critical Essays on Norman Mailer (1986), edited Norman Mailer’s Letters on an American Dream (2004) and Conversations with Norman Mailer (1988), and co-authored On God: An Uncommon Conversation (2008) with Mailer. He is an executor of Mailer’s estate and one of the architects of his archive. Mike Lennon will read from his upcoming biography of Norman Mailer at the Provincetown Public Library at 5pm on Thursday, July 28, 2011 followed by a reception at the Mailer home. This event is open to the public. Contact Jessica, at jessicaz@nmcenter.org, for more details.